The Fairy In The Wood. * Painting by John Bauer. When I was eight and my cousin, Patrick, was nine, our families spent Christmas in Ireland. It was the winter solstice, the bleak midwinter, and the mist was spiralling in white ribbons from the North Atlantic. The kitchen in Grandma’s cottage was warm, smelling of brandy and suet from the hundreds of Christmas puddings she had steamed for the ladies at Church. I had eaten so many raisins my tongue was stained for days afterwards and I couldn’t get the skins out from in-between my teeth. Patrick had filled his pockets with Californian walnuts which he munched under the covers after lights out. I was excited and terrified at the same time. If the fairy only came out once a year she might not appreciate two children intruding upon her wood. Some fairies could be nasty and cast evil spells – I had learned that from Enid Blyton. I wasn’t sure how Patrick and I would explain our hair turning blue or scales growing on our faces but I was so keen on seeing the fairy I decided to take the risk. We slipped out the back door when everyone was asleep. It was so cold the air felt like fingers touching my face. I stumbled on freshly fallen snow, it crunched as loudly as cornflakes. Patrick pulled a torch out of his dressing-gown pocket. It sent a tiny pulse of yellow light down the navy blue reaches of Gooseberry Lane. I was so enthralled I held my breath the entire way until my head was pounding and the smell of the gooseberries freezing in the night began to sting my eyes. I was mute with expectation as we entered the wood. The ocean rolled in the distance, so close in tone to the soft rustling of the leaves in the wood that it became hard to discern between one or the other. Patrick turned off the torch and took my hand. We gripped each other ferociously, as if about to fall off a precipice. A wind disturbed the trees, faint as a mistral. We felt the silken brush of it on our cheeks. A light rose in the distance, turning the snow as brilliant and unblemished as porcelain. There was a sigh that sounded like the embodiment of hope. And there she was, standing before us, not more than a foot high, wings fine as gossamer, unfurled; hair beaming in the moonlight – the fairy in the wood. She regarded us without hostility, glimmering, holding her tiny hands up to the sky as if trying to catch the moonlight. Then she sniffed the air and was gone. Just like that. We saw her for the briefest of moments but the memory of the sight of her stayed with us well into adulthood. 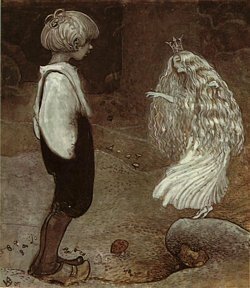 We saw the fairy in the wood, we were convinced of it, it wasn’t trickery or childhood imaginings. For the slightest of moments she was real and Patrick and I were two of the chosen few. And we believed, as I still do, that there is magic in this world. Then a gain, I’ve never been to Ireland, but I have eaten potatoes and I adore soda bread. That’s almost the same thing, right? I would bet she was waiting for you. Who better to write her story? Congratulations on being chosen! Magic is everywhere. Isn’t it grand? Oh wow! I have delicious shivers down my arms reading that. I have some of the blood of the Irish in my veins, I love reading such stories. Thank you for sharing it. Crafty Green – you are absolutely right. You can smell the magic there! Groovy – your sense of humour is very Irish. You are definitely an honorary Irishwoman! Karen – aye! It’s grand indeed. It is everywhere…..
Daoine – you know, I got shivers writing about it. There was a spooky element to it too. I remember shaking for hours afterwards but that could have been the onset of hypothermia! Bill – it is my absolute pleasure. So glad you liked it! Meleah – there is a lot of debate in our family as to whether or not it actually happened but I remain convinced!